What Else Can I Expect from an Online Organizational Psychology Program? Organizational psychology, also known as industrial psychology, represents an intersection between traditional psychology and modern business. Professionals in this specialized field apply psychological principles and theories to different areas of business, such as administration, human resources, marketing and general management. Organizational psychologists often assist with projects related to recruitment and hiring, policy writing, employee training and development and organizational evaluation. 'Psychology' and its subfields (including organizational psychology) are among the most popular majors for bachelor's degree-seekers. According to the National Center for Education Statistics, roughly 114,000 psychology bachelor's degrees were awarded during the 2012-13 academic year. However, most careers in organizational psychology require at least a master's degree in this field ― and in some cases, a doctorate degree as well. A bachelor's in organizational psychology will equip students with the foundational knowledge and skills needed to succeed at the graduate degree level. In addition to standard coursework, these bachelor's programs often include internships and/or practicum courses, allowing students to receive supervised training from experienced professionals. A comprehensive capstone project may also be required. Many of today's students are choosing to earn their bachelor's degree in organizational psychology online, rather than in a classroom. Online students follow the same rigorous curricula as their brick-and-mortar counterparts, leading to the same number of employment opportunities for successful graduates. The asynchronous (or self-paced) format of most online programs is also ideal for students with part-time jobs, childcare commitments and other responsibilities that tend to interfere with campus-based learning. Learn more about what you can do with an online bachelor's degree in organizational psychology and what kind of career opportunities you can look forward to with this comprehensive guide. WILL AN ONLINE ORGANIZATIONAL PSYCHOLOGY DEGREE PROGRAM PROVIDE ME WITH THE SKILLS I NEED TO ADVANCE MY CAREER? An online bachelor's degree in organizational psychology can serve as an important stepping stone toward a career in this demanding field. The curriculum will introduce important topics in business like training and development, human resources and management, as well as core principles of cognitive, developmental and social psychology. Internships and practicum courses also give students the opportunity to apply what they have learned in a real-world workplace environment. The best online organizational psychology bachelor's programs prepare students to succeed at the master's level. WILL AN ONLINE ORGANIZATIONAL PSYCHOLOGY DEGREE PROGRAM WORK WITH MY SCHEDULE? Online organizational psychology degree programs offer a flexible alternative to traditional college education. Students can access course readings and lectures, participate in virtual discussions with fellow students, submit written assignments, take exams and communicate with their professors on their own schedule. The latest learning technology also enables them to study away from home using a laptop, tablet, smartphone and other portable Wi-Fi devices. For added convenience, online organizational psychology students can normally coordinate internships and practicum courses at sites near their current residence. WHAT JOBS CAN I GET WITH MY ORGANIZATIONAL PSYCHOLOGY DEGREE? Although a bachelor's in organizational psychology will be insufficient for most careers in this field, students may be eligible for other roles related to psychology in the workplace. These occupations include human resources generalists and specialists, training and development coordinators, marketing analysts and social workers. Alternatively, those who choose to advance into a graduate-level program will be ready for the academic demands that lay ahead. WHAT ARE THE BEST ONLINE BACHELOR'S IN ORGANIZATIONAL PSYCHOLOGY PROGRAMS? Choosing a program is an incredibly personal decision, and only you can properly evaluate whether a target school's strengths match your educational needs. 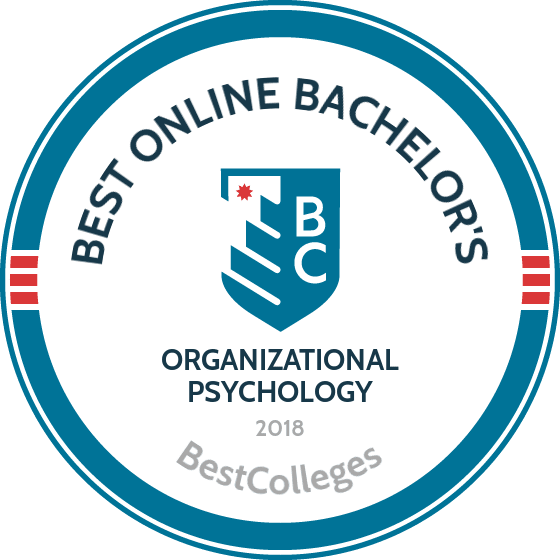 The following ranked list of schools should serve as a helpful starting point in your search for the best online bachelor's degree in organizational psychology programs in the United States. Our ranking is based on the courses schools offer, available specializations, student outcomes, career support services, and other criteria used to determine academic excellence. If you are considering an online bachelor's in organizational psychology, be sure to contact admissions specialists at different colleges and universities to learn more their about specific bachelor's degree requirements and offerings. Founded to serve personnel stationed at the El Toro Marine Corps Air Station, this Irvine, California institution is committed to providing quality adult higher education. Brandman offers more than 31 hybrid and fully-online undergraduate programs, including a BA in psychology with a concentration in industrial and organizational psychology. Designed for transfer students who have earned at least 12 credits at another institution, this 63-credit online organizational psychology degree explores the practical workplace application of psychological theory. Core coursework builds broadly-applicable skills in scientific writing, research, and critical thinking, while major courses introduce area-specific concepts. Applicants who do not meet transfer credit requirements may gain admittance by completing the school’s four-credit Brandman Track program. Brandman also offers college credit for prior military or professional experience, training, and standardized test scores. Brandman University is regionally accredited by the Western Association of School and Colleges Senior College and University Commission (WSCUC). The online organizational psychology degree offered by Eastern Kentucky University is ideal for students pursuing careers in human resources, career counseling, and psychology. The bachelor of science degree in psychology with a concentration in workplace psychology covers topics like performance management, occupational health, personnel policies, and administration. The 120-credit-hour curriculum includes courses on psychology of personality and psychological interviewing and reporting. A capstone project is required, which can be a thesis, seminar, or a survey course on the history of psychology. EKU offers six start dates per year, with each term lasting only eight weeks. This accelerated schedule is convenient for students who are employed full-time. Students have access to the PASS online tutoring program, which is designed specifically for psychology students The program does not result in certification or licensure in the psychology field, but it does prepare students for entry-level positions. Financial aid, military benefits, and employer tuition reimbursements are available for qualifying students. Combining flexibility and faculty support, this California institution presents its web-based degree programs in a synchronous format designed to foster communication. CUI’s 42-credit bachelor’s of science in organizational psychology focuses on the psychology of workplace productivity and employee engagement, introducing the skills needed to build and lead effective teams. Through a combination of self-paced coursework and live online discussions, students gain a thorough understanding of human resource and training strategies, business ethics, and employee performance assessment. Students with fewer than 45 transfer credits must complete CUI’s general education requirements before pursuing major coursework, while transfer students and those with an associate degree may earn their organization psychology degree online in as little as 18 months. New students must begin the program in August or January, although courses are offered throughout the year. Concordia University Irvine is accredited by the Western Association of School and Colleges Senior College and University Commission (WSCUC). The Florida Institute of Technology offers an asynchronous organizational psychology degree online. The bachelor of arts in applied psychology with a concentration in organizational psychology instructs students on how to become effective leaders through conflict management, promoting communication, and managing group dynamics. The curriculum emphasizes training, promotion, management, personality, and cognition. The five courses that make up the organizational psychology concentration include: psychology of leadership, employment and personality testing, organizational psychology and behavior, program development and evaluation, and a survey of industrial and organizational psychology. The program prepares students for careers in labor relations, consulting, and human resources. FIT boasts that 90% of their faculty hold either a doctorate or the highest degree offered in their field. Faculty make themselves available to students through email, video calls, discussion boards, and chatrooms. Notre Dame College is located outside of Cleveland, Ohio in South Euclid on a 53-acre campus. The college is a Catholic institution and was founded by the Sisters of Notre Dame in 1922. The bachelor of arts degree in psychology with a social and organizational concentration teaches students to recognize and analyze behaviors, as well as the mental processes that drive them. There are four concentrations offered: clinical and counseling, social and organizational, psychology of special populations, and psychology as a science. Course credit transfer programs and payment plans are available for online students, and the online program application is free. Credit hours cost $450, with a discounted rate of $250 for active military members. Applicants must have a minimum GPA of 2.5 and attend an interview with an enrollment counselor to be considered. According to U.S. News & World Report, the unemployment rate for organizational psychologists is currently set at 1.2%. This relatively low unemployment rate is due to two factors: the specialized nature of the profession; and the historically strong job outlook of the business sector. The following table compares the unemployment rates of industrial psychologists and other business professionals who deal in different areas of management and business analysis. As the table shows, organizational psychologists have relatively low unemployment rates compared to other specialized business personnel. Additionally, this figure is significantly lower than the unemployment rate for all occupations, which is currently set at 4.8%. However, it's important to note that the job outlook for bachelor's degree-holders in organizational psychology is not as favorable due to the advanced educational requirements of this profession. Candidates with a master's or doctorate in organizational psychology will be better positioned to compete in the job market and launch a successful career in their field of study. U.S. News & World Report lists $77,350 as the median annual salary for industrial psychologists in the United States. However, earning potential for these professionals will depend on a number of factors, including educational attainment, experience level, employer size and city/state of employment. The table below looks at the salary range of industrial psychologists working today. As the table shows, organizational psychologists in the highest-paid bracket outearn those in the lowest-paid group by a margin of more than three to one. Additionally, salary expectations in this field often vary based on specific job title. The next table looks at career salary growth for five of the most common careers that are attainable with a bachelor's degree in organizational psychology. All five careers listed on the table reported a salary growth rate of at least 15% after 20 years in the workforce. Training and development managers experience the highest rate of growth: a 37.6% increase in earnings between the entry-level and late-career stages. Management analysts ranked second with 33.2% career salary growth, followed by human resources specialists with 32% growth. Human Resources Specialists: Often working under HR managers, HR specialists typically oversee tasks and activities related to recruitment, screening and hiring of new employees. Depending on the size of their organization, they may also assist with training and development programs, and also assist employees with matters related to compensation and benefits, advancement and retirement. Human Resources Managers: Human resources managers (also known as HR managers) are responsible for all of the administrative functions of their company or organization. They manage specialists, generalists and other HR personnel, and may play a direct role in employee recruitment, hiring and training. Management Analysts: Management analysts (also known as management consultants) work closely with top executives to evaluate and optimize various aspects of a company or organization. The changes they recommend ― and eventually help implement ― target specific areas of improvement, such as profitability, efficiency, supply chain management and employee satisfaction. Training and Development Managers: Training and development managers coordinate various programs designed to equip current employees with various knowledge, skills and work-related competencies. They often study their company to pinpoint specific personnel needs, and then create programs that reflect these findings. Making professional connections and learning about different approaches to organizational psychology is crucial to your success. Professional organizations offer a great entry point for students who want to learn more about their chosen career path. Below you'll find three of the country's most prominent organizations established for organizational psychology professionals. These organizations host networking events, provide online trainings, maintain active job boards, and offer other services for career-ready college graduates. Society for Industrial and Organizational Psychology: This Ohio-based organization boasts more than 8,000 members worldwide. Member benefits include discounts on SIOP products and services, invitations to conferences and other networking events and online journal subscriptions. The organization also allows students and retirees to become members for only $50 per year.